Today we're here with a fab new Challenge for you, and we also get to meet some new faces too! 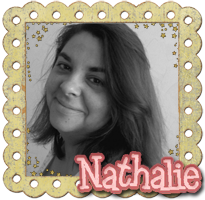 Firstly, we are delighted to be joined by Nathalie. Nathalie joins the Little Misses for our next term and makes the most wonderful creations with pretty details. 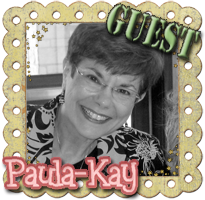 We also introduce our Guest Designer for October Paula-Kay. Paula-Kay regularly joins our Challenges with her well thought out, beautifully coloured projects. You can see both ladies debut cards in a moment and later on we'll get to know them a little better! Hello my name is Nathalie. I live in France, near Paris and I’m a primary school teacher. I've been making cards for almost five years now, how time goes by! I began with stamps, then I discovered digis. Then a revelation! Markers and especially copics. After a while, I also discovered coloured pencils which I really enjoy using. Colouring is new for me, and I still need to practice and improve. I like very much Little Miss Muffet Images and I was very surprised to have been asked to join the team. It’s quite a new experience for me to be a member of a Design Team and I'm very excited to work with so many talented women :) I hope I fit in! Hi! I am Paula-Kay from deep in the heart of Texas. I am a scrapbooker and stamper who loves to create! My hobbies have grown to now consuming the largest room in our house. I live with my husband and beloved poodle dog, Rusty. My house is now emptied of children but sometimes filled with grandchildren! They will soon be crafting with me, I am sure. Stamping is both a relaxation and ministry for me. I send many cards to family and friends for various occasions. Teaching stamp classes has occupied much of my time in the last ten years. It is a joy to join Little Miss Muffet during October as a Guest Designer. Thanks for this challenge. I always find these are to complete because I love layers, but this was a lot of fun. Thanks for a great challenge- perfect for me today as I'm crafting in a hurry so am designing my one layer on the computer. This means I can make a matching gift later today!! Lovely cards by the DT...and such a great challenge..